In Greek and Roman mythology, Castor and Pollux were the twin sons of L da and Zeus/Tyndareus (Pollux's father was Zeus, Castor's was Tyndareus), the brothers of Helen of Troy and Clytemnestra and the half-brothers of Timandra, Phoebe, Heracles and Philonoe. They are known collectively in Greek as the Dioskouroi or Dioscuri, "sons of Zeus", and in Latin as the Gemini ("twins") or Castores. 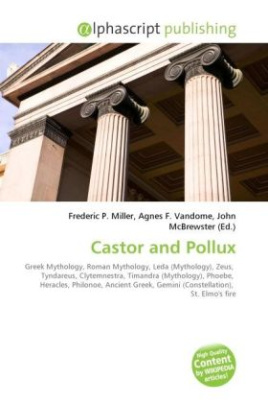 Castor means "beaver" in both Greek and Latin, and polydeukes means "much sweet wine". They are sometimes also termed the Tyndaridae in reference to their alternative fatherhood by Tyndareus. In the myth the twins shared the same mother but had different fathers which meant that Pollux was immortal and Castor was mortal. When Castor died, Pollux askedZeus to let him share his own immortality with his twin to keep them together and they were transformed into the Gemini constellation. The pair were regarded as the patrons of sailors, to whom they appeared as St. Elmo's fire.